The List's Eating and Drinking Guide keeps readers up to date with the food and drink scene in Edinburgh and Glasgow, covering almost 1000 restaurants, bars and cafés. With such a diverse culinary scene in both cities, Hitlists and Tiplists are highlighted in the guide to help you make snappy decisions when choosing where to eat out. But hearing where our readers have had some of their best meals is always insightful and that's where the List Reader Award in association with Birra Moretti comes into play. As the votes have come in thick and fast, we've whittled your votes down to the top 5 restaurants in each city to offer you choice in which restaurants get crowned the winners. The venues which receive the most online votes in each city will receive the List Reader Award at our Eating & Drinking Guide Parties in April. And remember, voting puts you in the running to win an overnight stay for two at Gleneagles with a three course dinner, breakfast and a voucher towards an activity. Since the Irani café hit St Andrew Square at the beginning of the year with its queues outside the door, Dishoom has had the whole city talking. An award winning fine dining restaurant in the heart of the city's New Town. Wedgwood's wine list is impressive and compliments an imaginative menu from a chef with years of experience. This tiny taqueria offers fresh and fiery soft tacos inspired by international flavours. A long standing favourite, Tom Kitchin's Leith venture dishes up seasonal Scottish produce in chic and contemporary surroundings. Made to order pizza and Italian street food served on long communal tables with DJs playing at the weekend. Oh and Civerinos boasts a Nutella Calzone on the menu, need we say more? All from business suits to a late-night party crowd fill this large, low-lit city centre steakhouse seven nights a week. A hit with coffee geeks and brunch fanatics, Café Strange Brew on the Southside caters to all with interesting salads, hearty bowls of mac and cheese and a vegan-friendly menu. Another popular Southside joint offering modern Italian dishes with a Scottish twist. Battlefield Rest promises interesting and stylish dining. Regular rotating kegs make craft beer a big attraction The Raven, and the smokehouse style grub is a particularly delicious added bonus. 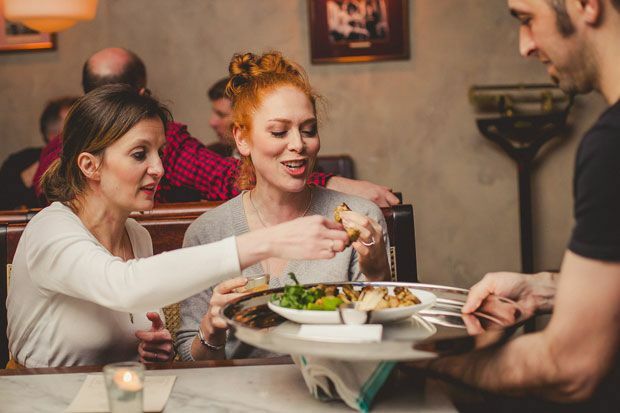 A chic city centre bistro, The Red Onion boasts a great pre-theatre menu and dishes that are sensitive both to the seasons and dietary requirements. Voting closes on 1 Apr 2017. The 24th edition of The List Eating and Drinking Guide is out on Wed 19 April.